Screen Australia and Google are funding four online projects – two half-hour comedies, a 45-minute documentary and an animated series. The projects will share A$725,000 (US$550,000) in funding from the third edition of the Screen Australia/Google initiative Skip Ahead, which aims to support the next generation of Australian creatives by enabling the recipients to make longer and more ambitious narrative content. The money is intended to fully finance each project but producers are free to raise additional funds. The 10 projects supported in the past two years have collectively clocked more than 5.5 million YouTube views and helped creators such as Aunty Donna and Mighty Car Mods to reach bigger audiences and build their brands. Skip Ahead backs narrative-driven films that can either be a one-off work, a pilot for a series or proof-of-concept for a feature, on the proviso that each is a standalone piece of entertainment. Adelaide brothers Danny and Michael Philippou – known as Racka Racka, whose Marvel VS DC video last year racked up more than 37 million views on YouTube – will deliver RackaRacka: Live (working title), a live-stream vlog that follows the wannabe filmmakers on a rampage through a haunted abandoned theatre. Triptych Pictures (The Babadook) will produce. The Superwog Show (working title) will see brothers Theo and Nathan Saidden, aka Superwog, tell the story of Superwog and his best mate as they navigate adult life and Superwog’s dysfunctional family. The show will be produced by Princess Pictures (Summer Heights High, Jonah from Tonga, It’s a Date) and Century Entertainment. In Mutant Menu, science educator and communicator Vanessa Hill will explore how genetic manipulation can create superheroes on YouTube channel BrainCraft, produced by Serendipity Productions’ Margie Bryant (Who Do You Think You Are?). Sisters Charli and Ashlee Kelly, who star in popular YouTube kids-only baking show Charli’s Crafty Kitchen, will make the animated series Crafty Kingdom, short narratives totalling 30 minutes, in partnership with Brisbane animation studio Like A Photon. What do you get when you combine the massive distribution platform of YouTube with the DIY digital revolution that makes filmmaking tools accessible to the masses? Meet Film Riot, the channel about filmmaking techniques that has garnered almost a million subscribers while producing its own content. And most recently, that content was pretty frightening. PICTURE donning a virtual reality headset to watch the football from a player’s perspective, catching the evening news bulletin with stories tailored to you and having more choice in content than ever. This is the future of Australian television and it’ll be here by 2020, as the industry enters its biggest era of change. The fact that a Hollywood megastar like Rachel Griffiths would lend her talent and expertise to a low budget YouTube comedy shows how much the landscape has evolved. In between major film and TV roles, the acclaimed actor co-produced and starred in Little Acorns — a hilarious web series about workers at a suburban childcare centre. Rachel Griffiths and co-stars of new internet series Little Acorns, Fanny Hanusin, Maria Theodorakis, Belinda McClory and Katerina Kotsonis. While the online space offers enormous opportunities to tap into a global audience hungry for video content, Griffiths said there are challenges that come with it. The cost of making a TV drama runs anywhere between $500,000 and $1 million per episode, so broadcasters are less inclined to take risks. “These days, you have to prove your product and your voice, and the web series thing is a platform through which to prove what you’ve got,” Griffiths said. One player embracing change is Fox Sports, where digital is seen as a way of enhancing the viewing experience. The subscription TV giant has a research lab where a dedicated team explores broadcast innovation, chief executive Patrick Delany said. “We’re releasing an app next week called Fox Vision and the first event we’ll use it for is Bathurst, and there will be a map in all of the papers next Thursday that you can point your phone at that to make it 3D so you can explore the terrain,” Delany said. With new gadgets, content boom, alternative platforms and personalised experiences, Australian TV will look vastly different by 2020. Here’s a snapshot of what’s coming. When it comes to sports, the big screen will remain the primary source but secondary, personal devices will allow “add ons”, he said. Regardless of how TV changes, Adrian Swift, Nine’s programming and production boss, believes content will always be king. What this means is TV networks will develop their own content niche, Mason said. Consuming content online, whether live or via catch-up, is a trend that Swift expects to continue in the coming years. There will come a time when Nine is a button on a remote as well as a mobile app, an add-on to set top boxes and game consoles, and a website. It’s a trend the company is already seeing — 9 Now has a unique total audience of 1.4 million, Collins said. Live news could soon contain stories that are tailored to a viewer’s preferences, based on past trends. The idea of customised content is something American outfit CBS News Digital is exploring, its senior vice president and general manager Christy Tanner said. Otherwise a fully personalised nightly news bulletin runs of the risk of just being stories about the Kardashian family. TV sets themselves are changing, with trends pointing towards devices that are integrated in the room. Some manufacturers are offering ‘in-wall’ sets that aren’t visible when not turned on, as well as screens built into mirrors. And the latest products are being billed as works of art. Regardless of where it’s seen, Swift said TV will be “a different version of the same thing”. 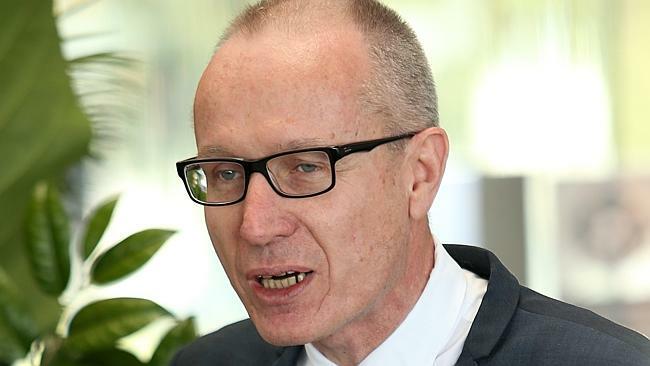 News Corp chief executive Robert­ Thomson has attacked Google for piracy, zealotry and kleptocracy for its disregard of copyright and distribution of journalism created by others. In a speech at the Lowy Institute Media Awards last night, Mr Thomson warned that, without proper remun­eration, well-resourced reporting would be further challenged in the future, with the digital age hostile to ­investment in ­journalism. Mr Thomson, in Australia for News Corp’s board meeting, said aggregators and distributors such as Google, Facebook and LinkedIn had a “new-found fondness for premium content” created by others, but had an aversion to paying for it. Provocatively, he also called LinkedIn “pretenders” and “spammers”. Mr Thomson said he was fortunate to be a custodian in a company that invested in thousands of creative acts around the world each day, from great journ­alism and compelling analysis to feisty blogs, capti­v­ating videos and brilliant books. But, he said, Google and other aggregators had little respect for original content or copyright created by media companies struggling to profit from news. “The words ‘intellectual property’ don’t appear in the Google alphabet,” he said. Mr Thomson said there was a “deficit in reporting resources created by the egregious aggregation of news by distributors for whom provenance is an inconvenience and who are contemptuous of copyright”. While media companies such as News Corp created important content, he said, the distributors were appointing editors not to create but to curate. “And these curators tend to have a certain mindset, a deep fondness for polit­ical correctness, and a tendency to be intolerant of ideolog­ical infractions,” he said. Mr Thomson contrasted this with the nature of newspapers, which were characterised by public debate and carried passionate arguments about issues­. Moving to a greater distrib­ution of politically correct content by the “e-elites”, Mr Thomson said, was taking place without any serious discussion of the social consequences. He paid tribute to News Corp’s executive chairman Rupert­ Murdoch and said that, without him, instead of being at a fine award ceremony that celebrated the continued importance of journalism, the group would be in the backroom at a dingy pub lamenting its passing. Media watchers around the world find no surprise in the move away from traditional forms of television. The writing has been on the wall since the turn of the century that the child of the digital revolution — internet protocol television — would become a substantial threat to incumbent free- to-air broadcasters and their ­subscription-based cousins. But what is surprising is the speed of change we are now seeing. It is not just fast or super-fast — it is happening at warp speed. Netflix does not declare its subscriber numbers in various markets, a tactic designed to maximise its negotiating position when it bids for rights. But we know in the first quarter of 2015 it had 42 million customers in the US and 21 million in the rest of the world. Netflix came to Australia in March this year, so very little of its Australian customer base would be reflected in those first quarter figures. Since March Netflix has been pushing its Australian services in competition with Presto, backed by Foxtel, Seven and Ten, and Stan, a Nine and Fairfax start-up. None of the parties are shouting their audience numbers from the rooftops, in part because many customers are testing their appetite for video on demand through free sign-up deals for the first month. Active subs may not be paying subs. Back in the days when three commercial and two public channels amounted to the total TV offering, FTA had 100 per cent of the nation’s eyeballs. After Foxtel, FTA maintained around 80 per cent of the total audience. If Netflix and other SVOD operators steal away another 20 or 30 per cent — as they inevitably will, in time — then FTA faces a triple whammy: falling viewer numbers, smaller audiences to attract advertisers and tighter advertising conditions as the digital migration continues. This, in turn, erodes its ability to produce high quality, compelling content capable of attracting large audiences. Of course, the FTA industry is not without the means to fight back. It remains strong in live events, whether they be news, sport or network-manufactured “must see” events such as MasterChef, The Voice or My Kitchen Rules. But news, sport and faux events don’t fill a 24/7 schedule. Seen from this perspective, there is no surprise in the stockmarket reaction to the FTA market leaders in Australia. The Nine network floated last year at $2.10 and traded as high as $2.35 at the end of May this year. It closed at $1.39 on Friday. Seven West Media was trading above $2 a year ago and is now 93c. These figures reflect the new reality. Hollywood demands government help so it can keep ripping us off. Advice from Google and others that piracy is primarily a “pricing and availability” problem has fallen on deaf ears, the government would rather listen to the likes of The leaked Online Copyright Infringement discussion paper, obtained last Friday by news website Crikey, is pretty much what we expected from Australia’s federal government. The opening statement pays lip service to ensuring that “content is accessed easily and at a reasonable price”. The rest is dedicated to outlining harsher penalties and technical countermeasures which are doomed to fail. It would be great to see Attorney-General George Brandis and Communications Minister Malcolm Turnbull jump to the defence of Australian consumers – whom they supposedly represent – as quickly as they jump to the defence of the powerful copyright lobby group. Advice from Google and others that piracy is primarily a “pricing and availability” issue has fallen on deaf ears, the government would rather listen to the likes of Village Roadshow. The Online Copyright Infringement discussion paper feels like the work of a government which wants to be seen to be acting, rather than a government which actually wants to address the underlying problem. Where’s the discussion paper considering the impact of this year’s Foxtel Game of Thrones deal on consumer choice, or what might happen if Murdoch gains control over both HBO and Foxtel? While we’re at it, where’s the discussion paper considering the role of parallel import laws in the digital age and the impact of geoblocking on consumer price gouging when it comes to entertainment? Last year’s IT pricing enquiry had a lot to say about Microsoft and Adobe but very little to say about Hollywood. Just like region-coding on discs, geoblocking exists so movie studios can get away with offering Australians less and charging us more simply because we’re Australian. Village Roadshow. Rather than addressing this issue, it seems the government is happy to support a ban on circumventing “technological measures” – which might include geoblocking – as part of the secretive Trans Pacific Partnership trade agreement. It’s been explained time and again how easy it is to bypass any technological countermeasures put forward to thwart piracy and geo-dodging. You don’t need to be a geek to master the use of proxies and Virtual Private Networks in order to side-step the internet service provider-level site blocking proposed in the discussion paper. There are even browser plugins which let you beat site filtering with a single click. Most people are prepared to do the right thing given the chance, unless they feel like they’re being ripped off. Content providers have been screwing Australians for years. Now that consumers have finally found a way to fight back, the industry is demanding government help so it can continue to screw us. Rather than put up laughably ineffective roadblocks to appease its powerful friends, the government would better serve the people by addressing the reasons why we break the law. Until it does, people won’t respect rules which are designed to ensure that Australians are treated as second-class citizens. ‘There’s a perception it’s a victimless crime, but it’s not,’ says Mark Batey of the FDA. The movie industry excels in selling dreams. But since the dawn of the digital revolution, there is one narrative they’ve consistently and conspicuously failed to sell: that piracy is theft and consumers who indulge ought to feel guilty about it. Recent research by Ipsos suggests that almost 30% of the UK population is active in some form of piracy, either through streaming content online or buying counterfeit DVDs. Such theft costs the UK audiovisual industries about £500m a year. This, says Batey, can be particularly detrimental to the independent film-maker who may have spent years raising money for the film and may have had to remortgage their house. Prewitt, who now heads the Independent Film and Television Alliance, points to its members who go to markets at festivals such as Cannes, Berlin and the American Film Market in Los Angeles (which is produced by IFTA) to present their project to buyers, who pre-commit to the film and then take it when it is finished, guaranteeing a minimum level of royalties to the film-maker. These pre-sales are then taken to a bank and used as collateral to finance the film. If the pre-sales aren’t secured, the bank won’t loan the money and the film doesn’t get off the ground. Each year, a huge number of these independent films are lauded at the Oscars: Dallas Buyers Club, 12 Years a Slave, American Hustle and The Wolf of Wall Street all went to market to seek independent financing. This reduction of revenue caused in part by piracy has also resulted in studios and production houses making less adventurous choices when it comes to films – just think of the prequels, sequels and remakes hitting screens this summer. Similarly, streaming television content illegally has a huge effect on the business, says Gareth Neame, executive producer of Downton Abbey. “Broadcasters will pay us money upfront, but it’s not sufficient to cover the cost of the whole production, so we look at the long-term value of our product and, based on all the ways we can exploit this, we cashflow against anticipated revenues,” he says. “If it comes to pass that the show doesn’t make those revenues because of illegal downloads, we don’t recoup the money, and we have to be more cautious. Phil Clapp, chief executive of trade organisation the Cinema Exhibitors’ Association, says that cinemas are losing about £220m a year at the UK box office due to piracy, representing about two months’ income in an average year. “We recognise that the vast majority of illegal content starts its life in the cinema, and because we remain the key source we have put a huge amount of effort into making our sites more secure and training staff and giving them the ability to take action,” he says. According to a 2010 TERA report, up to a quarter of a million jobs will be at risk if nothing is done about copyright infringement in the UK by 2015. Alex Hamilton, managing director of eOne Films UK, which has brought films such as the Twilight saga and 12 Years a Slave to British theatres, agrees with that assessment. There are a number of ways to consume content legally, says Hamilton, from cinema to video on demand subscriptions such as Amazon Primeand Netflix, and the cost is relatively low. Another crucial point pirates should understand is that nothing is free. When a consumer streams illegal content, these sites are making money, either through advertising or subscription costs. The Federation Against Copyright Theft (Fact) works with law enforcement agencies to prosecute piracy but also works to educate the public on the consequences of copyright infringement. “One message that is key is that, whether you’re pirating physical copy or streaming, you are putting money into the hands of a criminal,” says Kieron Sharp, director general of Fact. Fact general counsel Byron Jacobson says the organisation has also been working hard to prevent companies from advertising on infringing websites. There seems to be evidence, he says, of a significant decrease in the number of high-street brands doing so. And while Fact has proved to be a strong backbone for the entertainment industry when it comes to copyright infringement, support from outside the business has waned. The UK coalition government has moved slowly in implementing the Digital Economy Act, which addresses policy issues related to digital media, including copyright infringement, and it has been an uphill struggle to get internet service providers to help combat the issue. However, there is light at the end of the tunnel. In the UK, BT, Sky, Virgin Media and TalkTalk have reached a deal with the Motion Picture Association and the BPI, which represents the British music industry to send “educational” letters to customers who have downloaded illegal content. The process is expected to come into effect in 2015. Where have all the blockbusters gone? Overall, there have been more raunchy comedies and fewer family films — and, in fact, fewer tentpoles packed the season vs. last year. China’s box office is surging, while the domestic market shrinks. And the endless stream of sequels and reboots has failed to lure away crowds from the World Cup, barbecues and the beach. This summer almost certainly will fall short of last year’s record-breaking $4.76 billion haul. Films have been opening big, but flaming out quickly, with pictures such as the “Spider-Man” sequel and “Godzilla” debuting to nearly $100 million, then dropping more than 60% in their second weekends. Both have struggled to clear $200 million domestically. The lack of stickiness is evident across the digital watercooler. Leaving a huge void in the calendar, two major movies vacated the summer season: Pixar’s “The Good Dinosaur,” due to production delays, and “Fast & Furious 7,” owing to the death of star Paul Walker. The loss of “Good Dinosaur” deprived the season of a major family film in a year packed with R-rated comedies. Some of these laffers, such as “Neighbors” and “22 Jump Street,” were successes, but a dearth of films that appealed to children, save for “Maleficent,” “How to Train Your Dragon 2” and “Planes: Fire & Rescue,” has robbed the B.O. of some of its demographic dimensionality. When summer 2014 ends, there will be a few happy chapters, perhaps none more encouraging than the breakout success of “The Fault in Our Stars.” Produced for $12 million, the film, based on John Green’s bestselling novel, has taken in north of $225 million worldwide. In place of giant robots and costumed heroes, its selling point is the story of two teenagers who meet in a cancer support group. Yet, Fox made the bold decision to release the movie in the heart of popcorn season. “Like everyone else, we’re looking at 2015 and 2016, and the incredible lineup of films,” said Bud Mayo, chairman and CEO of Digiplex Destinations. Tomorrow is a brighter day. Deleting Facebook: more difficult than you might think. If you’re seriously considering deleting your Facebook account, you’re not alone. Start typing in the letters “dele” into Google and you’ll see “delete Facebook account” as a top suggestion. Whether it’s to alleviate privacy concerns or avoid digital distractions, more people are trying to figure out how to fully disconnect themselves from the social network giant that we live and breathe. For those ready to call it quits, you’re in for a surprise — it’s more difficult than you think to erase yourself permanently. With its ever-changing privacy policies, becoming Facebook-free requires more steps than just hitting the delete button and saying goodbye. Keep in mind deletion is not the same as deactivation. You can deactivate your account at any time, which means your Timeline and information will disappear from Facebook until you reactivate your account. When reactivated, your information is restored. Deleting your account means you can never, ever access your account again, and you won’t be able to retrieve any of your content or information. Most of your personal data, like your email and mailing address, is removed from Facebook, but some information, such as messages and photos, may remain on its server for “technical reasons.” Facebook’s Help Center also says the data left behind will no longer be identifiable or searchable as your own, and that it will be inaccessible to other people using Facebook. Australian brand funded online drama series The Horizon series has hit more than 21 million views on YouTube. The show which depicts the lives of a group of Sydney gay men hit the number following the US launch of its fourth season. The third season has claimed four awards at the 2014 LA Webfest following a successful run online. The show is averaging 40 – 60,000 viewers daily say its creators, and now boasts 73,000 ongoing subscribers to its YouTube channel. Brands behind the series include General Pants, NSW health promotion agency ACON, and DNA Magazine. The series is produced and directed by former Packed to the Rafters writer Boaz Stark, and is backed by producers Brian Cobb and Jacob Inglis and Executive Producers Tania Chambers and Rob Cannella. Series 4 features a number of Australian stars including Belinda Giblin and Barry Quin with cameos from Gretel Killeen and Jonny Pasvolsky as a vivacious nurse and a caring Priest. “We have found some great ways for people to be involved with The Horizon series five and six, through pledges towards the production costs, which will then enable us to offer various opportunities like a walk on role or name your own character, as well as executive producer titles to those wanting to pledge” said Cobb. “Pledges can be made from $100 offering fantastic opportunities at every level”.